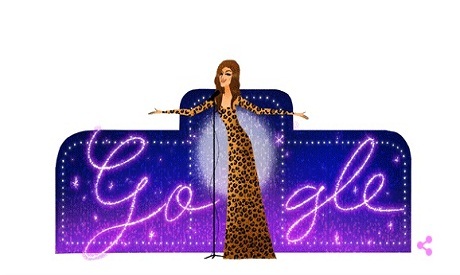 Google is celebrating on Thursday the 86th birthday of late Egyptian-born Italian-French singer Dalida with an animated doodle that switches between her most iconic looks. Born Yolanda Cristina Gigliotti on 17 January 1933 in Egypt, Dalida grew up in Cairo's Shubra district. She was crowned Miss Egypt in 1954, before moving to Paris later the same year to start her on-screen career. Dalida made a breakthrough in her singing career with her single Bambino, which tells the tale of a heartbroken boy playing beautiful music on his mandolin. The song became a hit in France, spending most of 1956 at the top of the charts. Dalida peaked in fame both locally and internationally during the 1960s, selling over 130 million records. Her career began in 1956 and lasted for 30 years until her last album in 1986, less than a year before her life ended tragically with suicide on 3 May 1987. Dalida was a multilingual artist, singing in German, Italian, Spanish, Arabic and French. Also an actress, Dalida starred in the Egyptian film Sigara w Kas (A Cigarette and a Glass, 1955), and in Al-Yom El-Sades (The Sixth Day, 1986). During her life, Dalida was honoured several times, mostly with awards specially created for her or impersonators singing her songs at events. After her death, various artists covered her songs, some in tribute to her. Dozens of concerts, galas and TV appearances were held in several European countries to annually commemorate the anniversary of her death. In 2016, the movie 'Dalida' was released in tribute to the singer.